There is one topic that every hiker thinks about, dreams about, and talks about—FOOD! 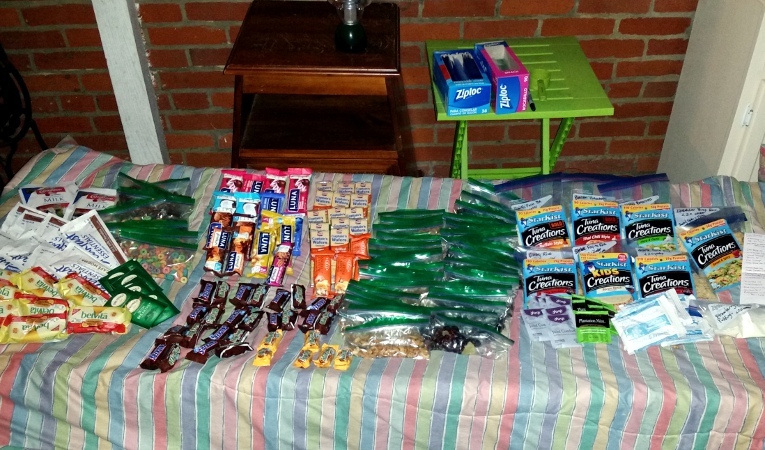 After the first few days, when hikers are too tired to eat, “hiker hunger” reaches epic proportions. It takes 3,000 to 5,000 calories daily to replace what is burned by carrying a heavy pack on mountainous trails. 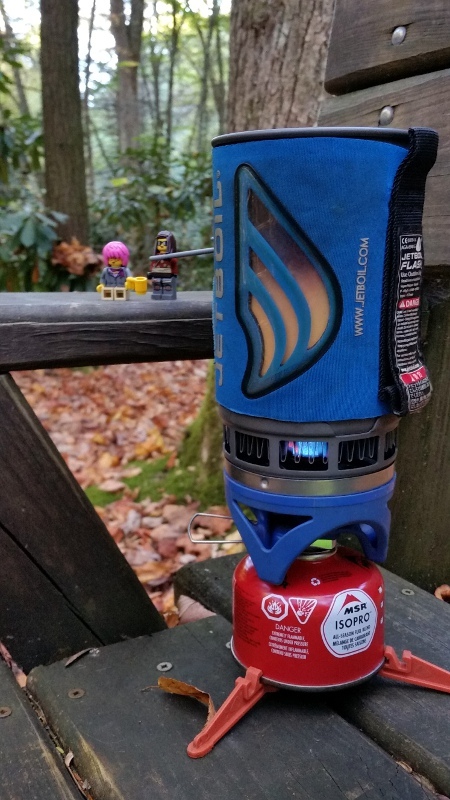 Story Seeker and Andowen carry 5-7 days of food in their packs. 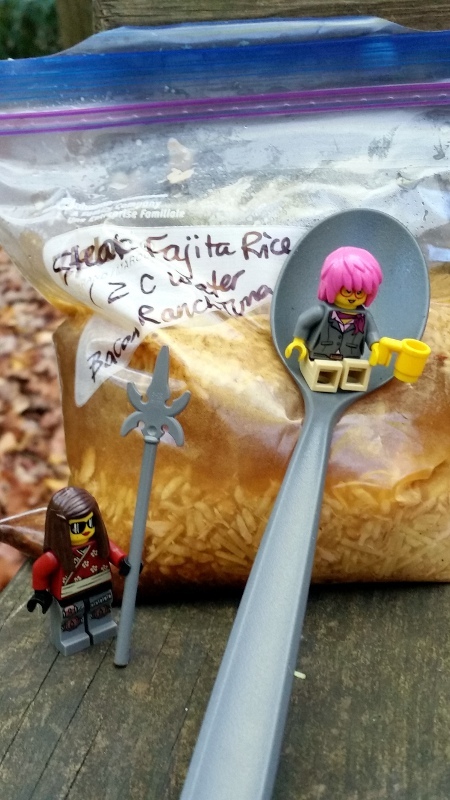 Showers and soft beds are nice benefits of stopping in towns along the trail…but the most important reason for a town day is to resupply meals and snacks. 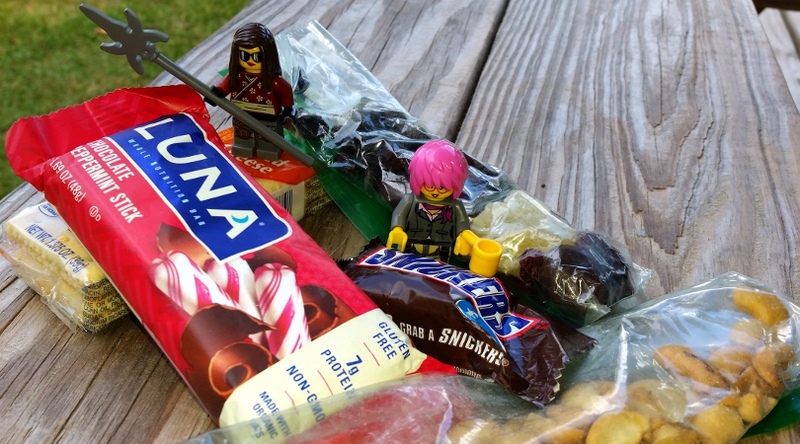 The Tiny-Mes stay out of the way as food is repackaged and stuffed in packs. They don’t want to accidentally find themselves in the trash pile with all the wrappers and heavy packaging! Neither Story Seeker nor Andowen are “morning people.” No time is wasted for cooking with our Jetboil Stove that specializes in bringing water to a boil in a little over one minute. “Hot drinks coming right up!” chirps Tiny A cheerfully. Both Story Seeker and Tiny S need a big cup of hot caffeine to start their day. (Why do you think Tiny S carries a mug with her at all times?!) Andowen and Tiny A prefer to slurp down a breakfast drink and munch on dry cereal while they walk. Snacks and lunch are portable—eaten cold as we hike. When Andowen gets grumpy or Story Seeker walks slower and slower, Tiny A reminds everyone, “EAT! EAT!” It is important to eat calories every hour to keep up energy and avoid blood sugar crashes. Daily snacks include nuts, dried fruit, cheese crackers, candy, and a protein bar. Once we get to camp for the night, it’s time to cook dinner. Tiny A and Andowen argue over which of the remaining meals is most tasty, but they finally agree on which dinner-in-the-bag to fix. Tiny A lights the stove with her magic staff. (Yep, that’s one use for it!) Hot water is poured into the thick freezer-weight bag. A few minutes later the rice or potatoes with tuna is ready for everyone to eat. “Save some for us!” complains Tiny S. After dinner and evening hot drinks are finished, all “smelly things” have to be bundled in secure bags. (This includes food, trash, and toiletries—anything a bear might find interesting.) The Tiny-Mes help find an appropriate tree—not too close but not too far from camp. 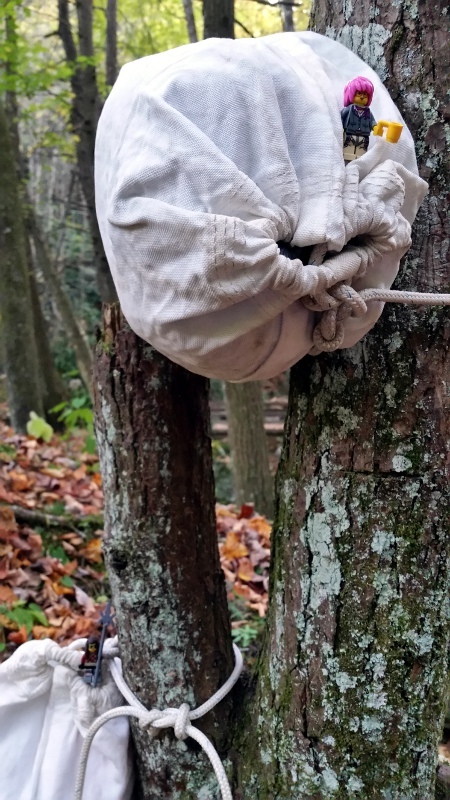 Andowen carries the heavy bags and ties them tightly to a branch. Sorry, Bears! No human food for you tonight… Occasionally, when hikers are fixing dinner in camp, they might discuss trail food. But rich, greasy, calorie-laden TOWN FOOD is the stuff of dreams. When hikers meet on the trail, they exchange information about the best places to eat in upcoming towns. Folks might disagree on whether burgers are better, Chinese is top-choice, or pizza is perfect. But everyone agrees a cold drink with large portions of food at cheap prices is the most important consideration. 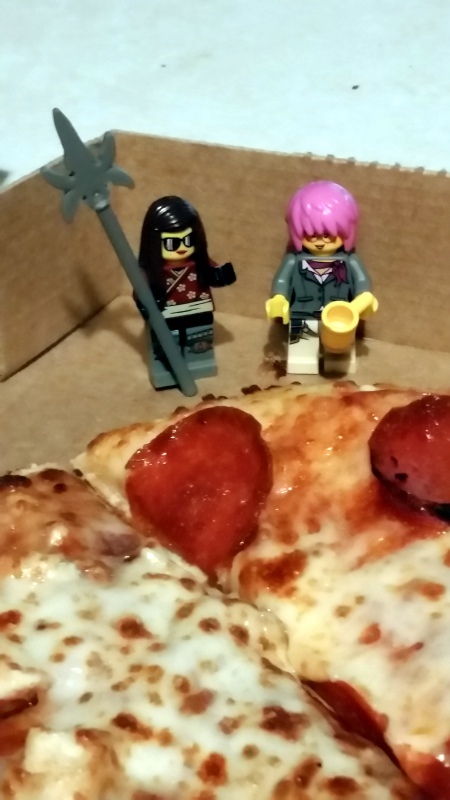 Now the Tiny-Mes are hungry (again). When do we get to the next town? !